Pundits love to claim that America’s job market will come roaring back as soon as everyone learns to “embrace the innovation economy” and churn out more high-tech gadgets. Well, maybe they should think different. Two academic researchers at the Asian Development Bank Institute in Tokyo recently found that the most iconic American gadget of all—Apple’s iPhone—last year added $1.9 billion to the US trade deficit. As the chart makes obvious, it’s unfair to blame the entire trade deficit on China, which accounts for just 3.6 percent of the phone’s wholesale cost. Citing some of the figures yesterday, the Wall Street Journal argued that “the practice of assuming every product shipped from one country is entirely produced in that country no longer reflects the complex reality of global commerce.” That’s certainly true. Yet the Journal neglected a more important point: There’s nothing forcing Apple to manufacture the iPhone abroad. The ADBI researchers estimate that Apple’s gross profit margin on iPhones in 2009 was a whopping 64 percent. This leads them to conclude that “profit maximization behavior,” and not competition, is what’s driving Apple to China. In other words, Apple would rather make a little bit more money than employ more Americans. 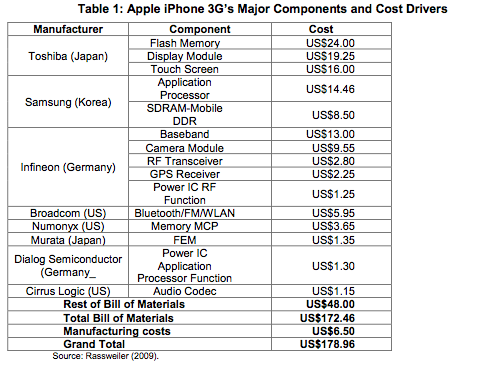 If all iPhones were assembled in the US, it would have added $5.7 billion to US exports last year. When are we gonna get an app for that?